Opening Sentences: Note: Instead of quoting the first two lines of the book, I am quoting the first lines of three of the seventeen original lullabies included in the book. Synopsis: This project grew out of one person’s experience of losing a loved one to breast cancer. Her response was to go to some of her friends – actors, singers, designers on Broadway – and ask them to write, perform, illustrate new lullabies. 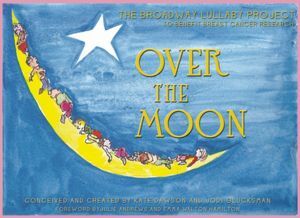 The result is a book filled with dreamy, whimsical, imaginative lyrics paired with dreamy, or whimsical, or imaginative illustrations by some of the foremost names on Broadway today, accompanied by a CD that features the lullabies sung by others whose names are notable. The notable names aren’t what remains with you, however, it is the words, and the pictures, and the melodies – and the fact that no-one in this world, no matter how noteworthy or otherwise, is untouched by cancer. Proceeds from the book go to cancer charities. For more information about the project, please see the official website, Over the Moon Broadway. So, while it isn’t a storybook for children, it is without doubt a book to share with children, to read to children, to sing with children, and to perhaps open conversation about cancer with children. Activities/Resources: The first and most obvious activity is to listen to the accompanying CD, to learn the lullabies, and to sing them to or with your children. Rock them, give them the assurance of complete safety, of being loved, and sing to them. As this article in the UK Guardian states, singing with very young children may help them in their language acquisition, among the many other benefits. Children from 3 or 4 on up can talk about the different styles of songs, the different styles of illustrations, and even draw their own illustrations for their favorite lullabies in the book. In our family, we had a few family lullabies that were unique to our family. Children (and adults) could be encouraged to make up their own songs to soothe babies (or themselves). Availability: Readily available in hardcover. There is also a 26-song e-book, and a 26-song 2-CD set. I’m so glad to see this book here today, Beth. Just this week we had the news that a top champion and scholar of children’s poetry is undergoing surgery for breast cancer, so this post is timely. I ask everyone to send good thoughts into the universe. And I, too, benefited from a parent who was always singing — in my case, my Mum. She and I were still singing together til not long before her death, and I sang to her in the moments just before she died. It was so precious. What a lovely gesture, Beth. The lyrics are beautiful. The lyrics are lovely, and the illustrations are, too. Thanks, Erik! It’s definitely a great book for parents to share with their kids, or older brothers and sisters to share with younger ones, especially since there’s a CD. You shared such beautiful lyics. What a lovely choice for childrens. It’s perfect that it is accompanied by a CD so children and parents can sing the songs together. This is supporting such an important cause. Thanks, Pat — yes, I’m delighted that there’s a CD, because then people truly can sing the songs with their kids. And the cause is so very important. A beautiful book for such a worthy cause. Must look this up as October is Cancer Awareness Month here. October is Breast Cancer Awareness Month here, too. I wish I’d thought to mention that was coming up. Thanks for the reminder, Diane! This sounds like an amazing compilation. Thanks so much for sharing it with us! It is truly lovely, Amy. There are soothing lullabies, and fun ones, and great illustrations. What a lovely, special book, Beth. I’m so glad you shared it. It seems rather unique on our list, with it’s emphasis on singing lullabies, and I’m so glad to have it – also because I hope it will encourage people to purchase their own copies and support the cause. Thanks for adding it to our list! Thanks, Susanna. I wondered about including it, but soooo wanted to. I, too, hope that people will purchase their own copies and support the cause. I saw this on one of the HUB’s web sites last week and am glad you pitched it here as well. As you said almost everyone knows someone who has cancer. My late husband died of lung cancer and I can pick out five women friends who had breast cancer. Thank you, Clar. It is a wonderful book, and I hope many people will find themselves touched by it, and will share it with their children. sounds like a lovely book. thanks for sharing it with us. Thanks Darshana, it is a lovely book. Thanks, Vivian. This was a great one to think up activities for. Come to think of it, with your book with its added recipes in mind, I could have included some bedtime snacks as well!